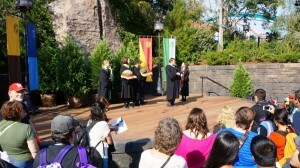 These two 10-minute shows are performed on the outdoor stage between Hogsmeade Village and Hogwarts Castle. 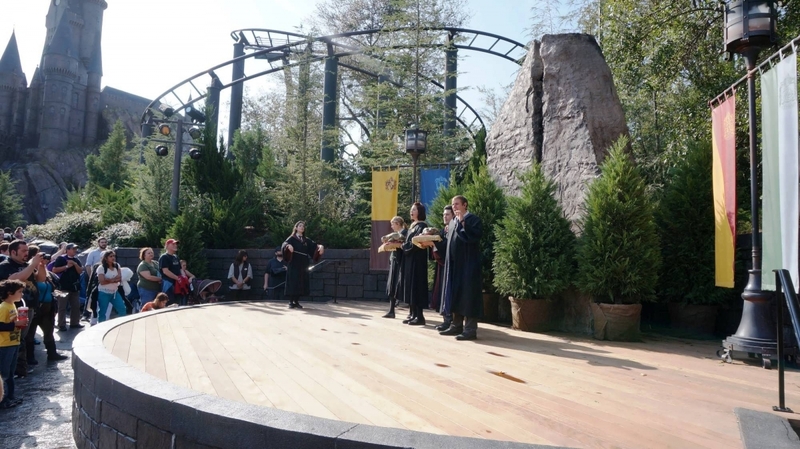 Neither performance is overly impressive or engaging (the Spirit Rally features performances by the Beauxbatons and Durmstang students; the Frog Choir is just that – a frog choir), but fans of Harry Potter will enjoy seeing another aspect of the books and movies brought to life. This is tricky because, of all the performances at Islands of Adventure, these two are the only popular shows for which Universal does not publish times in their in-park guide map. That being said, the two shows generally alternate once an hour. The next showtime is displayed on electronic signs across the park. In addition, the show times are listed on Universal’s mobile app. 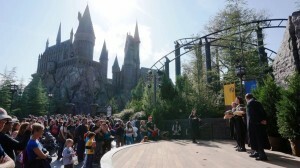 In December 2012, a stage was finally added to the performance area. Now it is very easy to get a good view of the shows from any distance. The first video is the Frog Choir, shot after the new stage was put in place. 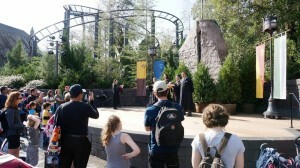 The second video is the Triwizard Spirit Rally, shot before the new stage was built. Both of these shows are fun to watch and can be a great way to break up your day! I love this! I love love loveee the Tri-Wizard spirit rally! I am a dancer myself and the little performances were great! Definitely reccomend this to anyone who wants to take a break from the rides(although, who wants to do that? 🙂 )! Love this addition! It is so fun to watch and really brings one of my favorite books to life! The sound could be a bit better quality. If you aren't standing right in front, it just sounds jumbled with the noise of the crowds but what you can see is awesome! The biggest issue is that you don't know when it's going to happen so you can't prepare to stop there and witness the magic. Because of that, noticing it has started (again, because of the noise level during busy hours) is difficult so by the time you get over there to see it, usually you have missed most of it. For something that is marked on the map, it seems silly to let most park guests miss this. The Frog Choir and the Tri-Wizard Spirit Rally are my wife's favorite attractions in Hogsmead. She has a thing for frogs and thought they were the cutest ever. I thought the Team Members did a great job singing and acting for both shows. 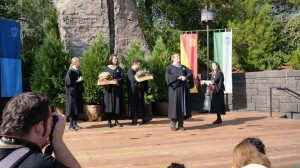 It's a must see when in Hogsmead and really show you support for them! The TSR & FC are really cute to watch. They bring back memories of the fourth book and movies. The costumes are very close to what they appeared as in the movies. 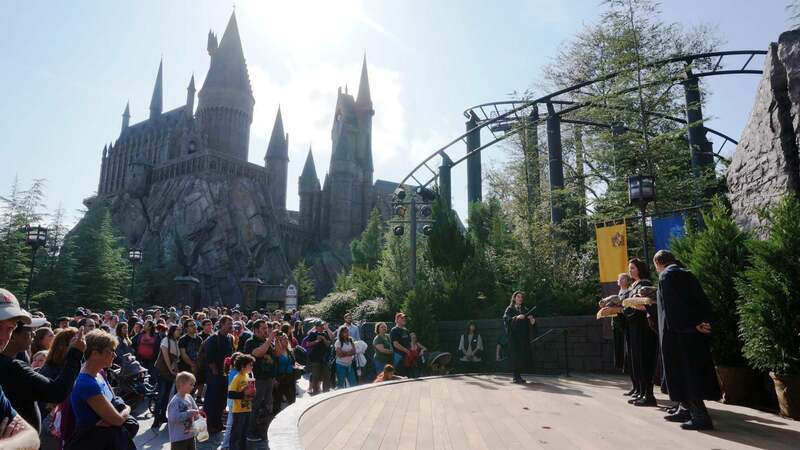 It fits right in with Hogsmeade. View OI’s map of Universal’s Islands of Adventure.